I suppose having an iPad mounted to the steering wheel of my 95 Nissan Pathfinder would probably be some sort of distraction or something. I guess I'll have to settle for the Kolos iPad Racing Wheel. 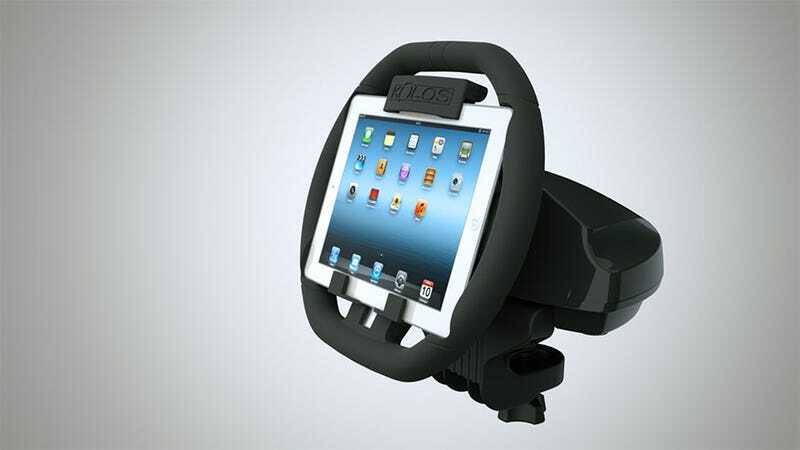 The Kolos iPad Racing Wheel is effectively a traditional racing wheel controller with a place to slot your iPad. It's brilliantly simple. I'd imagine it would enhance immersion in games like Need for Speed Most Wanted quite a bit, once one gets used to the notion of the entire windshield tilting back and forth. The Kolos wheel on sale November 5 on Indiegogo ($65 for the wheel, $99 for the wheel +base).